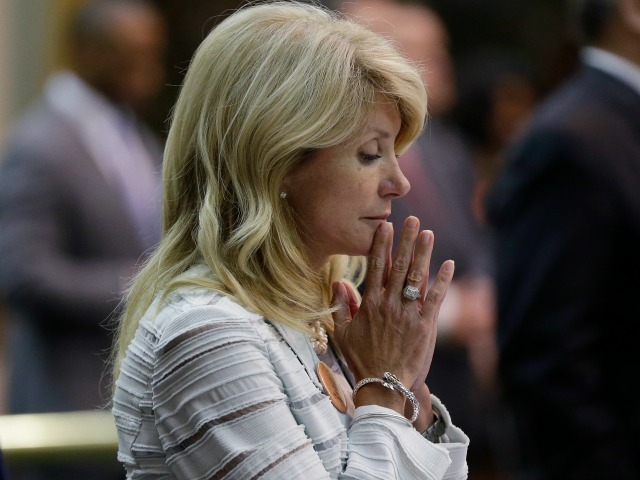 Last week, the Wendy Davis campaign surprised Texas with an abrupt pivot in conversation. Under a firestorm of criticism for the many falsehoods touted in her biography, a candidate known only for amorphous “feminism” and support of abortion started talking about guns. Now, in the middle of the scandal, Davis suddenly decided she supports gun rights. Davis and her campaign told the Associated Press last week that Davis expects to campaign to “expand where people may carry handguns.” While much of the AP’s conversation with her involved discussing why she will not talk about details of her personal life now that she has made it the centerpiece of her campaign, she did shoehorn in chatter about her plans to help gun owners. This might come as a surprise to those who know Davis as a one-trick pony on abortion, which she has tied to feminism and made a platform out of. After all, gun rights are not mentioned anywhere on the “Issues” portion of her website, and she herself has said little about guns until today. Perhaps this is because before she suddenly did an about-face on the matter so strong as to want to pass legislation that lets Texans leave guns in their cars at work, she was one of the NRA’s worst enemies in the Texas Senate. A former Republican who donated to Republican candidates and voted in primaries as recently as 2006, Davis was initially looked askance at by Texas Democrats, who seemed to view her with suspicion. She took that as a “compliment,” because it showed people understood she “wasn’t driven by” ideology. Republican opponent Greg Abbott, who has a strong record of supporting gun rights, initially highlighted Davis’s unpopular stance on guns in Texas, perhaps triggering this reaction from the Davis campaign.